The Thunderbolt by HTC is a 4G capable Android smartphone for Verizon Wireless featuring an 8 megapixel camera with HD video, along with a front-facing camera for video chat. The Thunderbolt has a 4.3 inch full touch display and can connect up to 8 other Wi-Fi enabled devices to the Internet (with appropriate rate plan). Access tens of thousands of apps for your Thunderbolt at the Android Market. 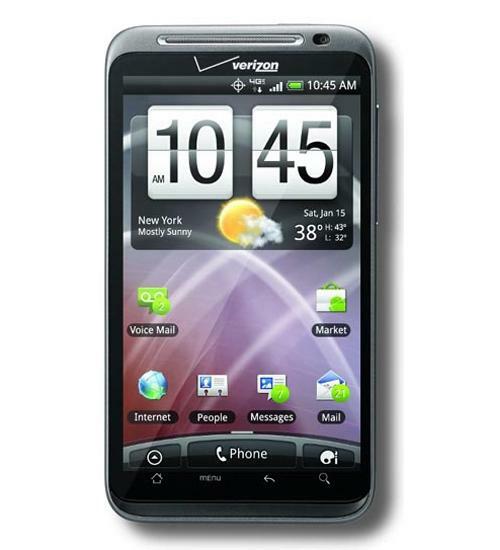 The HTC ThunderBolt is the first 4G phone for Verizon Wireless. Featuring a 4.3-inch LCD display, a front-facing camera and a kickstand that will support the phone either vertically or horizontally, the ThunderBolt brings a new level of power to Verizon's Android phone line-up. HTC ThunderBolt vs. HTC EVO 4G - Schmackdown! The HTC ThunderBolt and the HTC EVO 4G are both hot cell phones that can do 4G network speeds. With their big screens, front-facing cameras, kickstands and powerful internals, the ThunderBolt and EVO 4G are natural rivals - even if they have much in common. How do they compare when placed head-to-head in this Wirefly Schmackdown? HTC ThunderBolt vs. Verizon iPhone 4 - Schmackdown! The Apple iPhone 4 and the HTC ThunderBolt are two of the best phones for the Verizon Wireless network. Different in many ways, they are two approaches to getting yourself a pocketful of power. And yes... you can make phone calls with them. How do these two excellent phones compare in a Wirefly Schmackdown? This is the second part of Wirefly's review of the HTC ThunderBolt cell phone. This video walks through some of the apps on the ThunderBolt, as well as a look at the location of the microSD card, SIM tray and opening "ThunderBolt" splash graphics. The HTC ThunderBolt and Apple/Verizon iPhone 4 are both powerful, but how quickly can they open a web page? In this video, Wirefly compares how the two phones can access the same web page. The HTC ThunderBolt is the first phone to use Verizon's LTE 4G network, and it may surprise some that the ThunderBolt requires a SIM card for 4G operation. In this video, Wirefly's Bob Kovacs shows where the SIM is installed, then he fires the phone up to test the Internet connection speed. The HTC ThunderBolt is the first phone to use Verizon's LTE 4G network, and everyone wants to know how it compares to the iconic Apply iPhone 4. In this video, Wirefly's Bob Kovacs runs a side-by-side Internet speed test to compare the the two phones. The HTC ThunderBolt on Verizon Wireless hit the ground running last week with record-breaking sales. Many more people are interested in knowing how the phone compares to the popular Apple iPhone 4, and one way to compare is to go head-to-head with the phone's cameras. In this video, Wirefly's Bob Kovacs shows some photos from each of the cameras. Also compared is a video from each camera.